In a medium bowl, toss the eggplant with the sesame oil, hoisin sauce, garlic, tamari, ginger and rice vinegar. Toss until all the eggplant is evenly coated, then tip the whole bowl into a large frying pan. Fry on moderate heat until the eggplant is cooked through and has started to caramelise in places. While the eggplant is frying, steam your bao buns according to the instructions on the packet (alternatively, cook your rice). 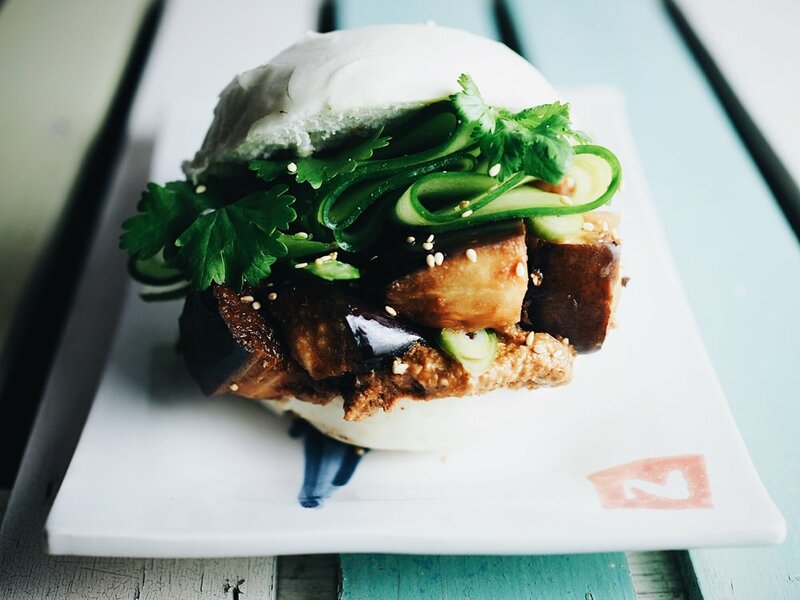 To serve, cut each bun in half and spread with the pine nut paste, then fill with the eggplant, cucumber strips and spring onion. Sprinkle the sesame seeds and fresh chilli (to taste) on top of the buns before serving. Eat while steamin’ (makes 3 serves).